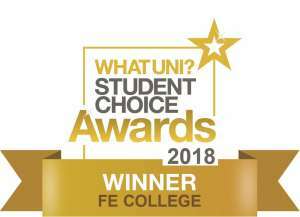 WhatUni Student Choice Awards 2018 – Bridgend College wins FE category! We are thrilled to announce that Bridgend College has been voted winners of the FE category of the ‘What Uni’ Student Choice Awards 2018. The award ceremony was held at the Brewery in London on the 19th of April and was attended by members of our staff. The College was up against some fantastic FE Colleges from around the UK. Three new categories were introduced for this year’s awards, one of those being the Further Education College category. 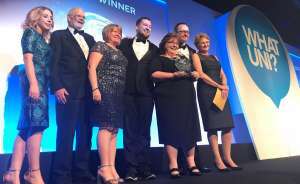 Being the first to win this prestigious award, Bridgend College is proud to be a flagship college for Further Education in Wales, as well as for the UK. WhatUni is the most comprehensive course comparison site in the UK and guides potential students from their initial research to deciding their final choices. Over the last year, the team has collected over 36,000 student reviews by conducting campus visits and collating information from social media posts and mail shots. “They have helped me get where I need to be in my chosen career. I have received plenty of support throughout and I couldn’t fault the staff”. The award is an annual celebration of student satisfaction in higher education and is completely student led. Bridgend College is extremely proud to represent Wales in this category and delighted that our students feel that the College is worthy of such a prestigious award.